When you’re actively engaged with SEO you will find that SEO results are not readily visible. You won’t immediately see a rise in Google or you’ll get a lot more visitors to your website. The be up-to-date with the content on your website is a good start. You can strengthen this base by using some SEO wins. These SEO wins are based on the latest developments in search engine marketing. 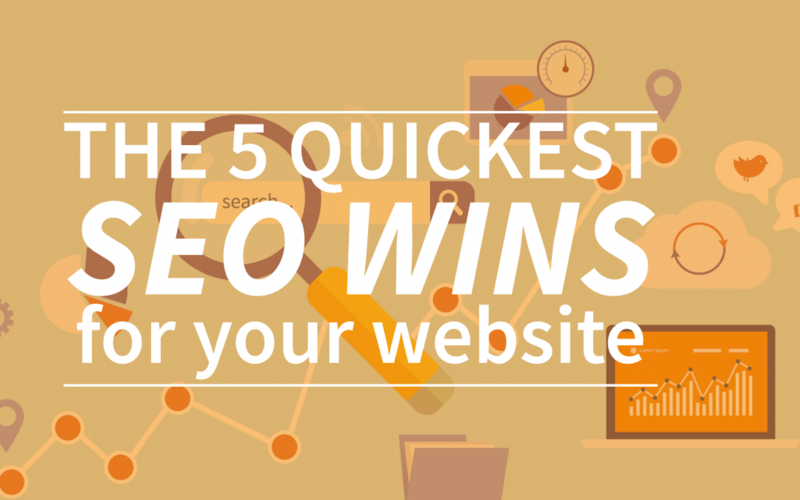 So these five SEO wins are definitely worth trying! Maybe these SEO wins will bring new visitors to your website? Google search console can be used to analyse results in search engine marketing. You can quickly see what yield your efforts in the field of SEO is. With Google search console, you can analyse whether you’re using the right and expected keywords. Are the keywords still in line with the topics of your website? In view of these keywords you can check if Google understands the subjects of your website. You can check this by looking at a list, containing the most frequently used keywords. Not only you’ll see which keywords are bringing you the most visitors, but also exactly how many visitors it brings. Besides this information about organic search results, Google search console provides information about links to your website. You can see exactly which websites are referring to your website and so you can see what content is popular. Indeed, there is an option to see what content is most commonly referred to. Google search console provides so much useful information that can be used well in responding to your target audience. Write a blog about a topic that is popular in order to attract even more visitors to your website. With this win you’ll make sure that search engines will understand your site faster. Here are some solutions that take only a few minutes. Firstly, it is important to ensure that all of your images have alt tags, images also contribute in making your website easier to understand to search engines. An Alt tag is the title and the description of the image. In addition, title and meta description tags are descriptive and unique. A meta description is a small text file that can be found under the title of your website in search engines. It is important to write the title and meta description yourself and you don’t automatically generate a meta description. You can write a good title to use your keyword once and using related words. Note that you use these related words in a natural way so you’re title will feel. When writing a good meta description, it is important that you don’t use more than 160 characters, you keep it relevant and you briefly summarize what the page is about. And don’t forget to use your keyword. It would be a shame to do nothing with these technical solutions, because they cost little time and still contribute to the SEO of your website. Why won’t you let your pages that rank well on search engines allow to get an even better score? Suppose your page is in eighth position, wouldn’t it be even better if the page could grow to the top five? Even though it seems the difference between the eighth and fifth position is not very large, yet this is an important difference. Search engine users earlier go to webstite that are high in the search engine. The higher your website is in the search engines, the more likely it is that your website will be visited. The difference from the place of your website in search engines can be achieved by reactive SEO. Reactive SEO stands for search engine optimization on the basis of statistics. You hereby start by measuring your current position in the search engines. After that you can mesure where the points for improvement are. Google search console, from the first win, is a very handy tool for reactive SEO, because with this tool you get a good overview of your stats. Nowadays websites are increasingly visited by mobile phones. It is therefore important for visitors that your website is mobile-friendly. In addition, mobile-friendly sites perform better in search results. When you use a search engine on the mobile phone come, the first results will be mobile-friendly websites. A while ago, Google also stated that there was an update, mobile-friendly sites get priority over other websites. Google made the statement: “As more people use mobile devices to acces the internet, our algorithms have to adapt to prosthesis usage patterns.” The reason for this was the increasing mobile traffic. Pretty easy right these SEO wins? Use these SEO wins in addition to writing your text in webtexttool for optimal results! Start your free trial now! Do you know a few good SEO wins? Do not hesitate to share these SEO wins with us on Twitter @webtexttool.